The Tyne River has always been central to the development of the city of Newcastle. For example, the river was the reason that the Romans first settled the area in 120AD, and centuries later the River was a significant factor in Newcastle's huge shipbuilding industry. Even today one of the most famous sights in Newcastle is the six bridges that span the Tyne River, all of which were officially opened by royalty. 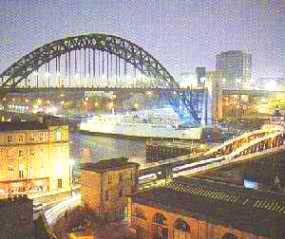 The most famous of the six bridges is Tyne Bridge, which was opened by King George V in 1928. At the time it was the largest single span bridge in the world, but then the record was broken by the Sydney Harbour Bridge, which opened in 1932. The two bridges have a remarkably similar design, and many people will claim that the Sydney Harbour Bridge was a copy of the design of the Tyne Bridge. But although the Tyne Bridge opened 4 years earlier than the Sydney Harbour Bridge, the designs for the latter were actually submitted before work began on the Tyne Bridge! To the west of the Tyne Bridge, the High Level Bridge crosses the river. This bridge was opened in 1849 by Queen Victoria and was designed by local engineer Robert Stephenson. It was a significant achievement for it was the world's first combined road and railway bridge, with the railway on the upper deck and the road running below. An equally remarkable feat of engineering is Newcastle's famous Swing Bridge, which was built in 1876 and located between the Tyne Bridge and the High Level Bridge. The extraordinary swing mechanism is driven by hydraulic pressure, the whole of the bridge moving around its central point. The Swing Bridge is located on a very historic site for this is where a Roman Bridge first spanned the Tyne River to the fort of Pons Aelius. Ever since there has always been a bridge across the river at this point. The other three bridges that cross the river combine to make an arresting sight, particularly at night when some of the bridges are lit up.